Want to get to know Romania? Exit Bucharest, visit Apuseni! Want to Get to Know Romania? Exit Bucharest! France – Paris, Great Britain – London, Germany – Berlin. Ukraine – Kiev, Italy – Rome (fill in the blanks). Whenever we talk about visiting a country we associate it with its capital city. It’s easy, you probably can reach it by plane very fast and at low costs, it’s safe, it does not raise any major risks and is as comfortable as possible, with cosmopolitan capital cities hosting five-star hotels and international cuisine. And most of the times it’s very familiar. But is that what you came there for? I believe that, if you want to get to know a country, you also need to get off the grid and out of the capital city. With this goal in mind, I am going to try to get you just a little bit interested in Apuseni region in the Western Romanian Carpathians. I have a list of things for you to do/try, always willing to add to the list. 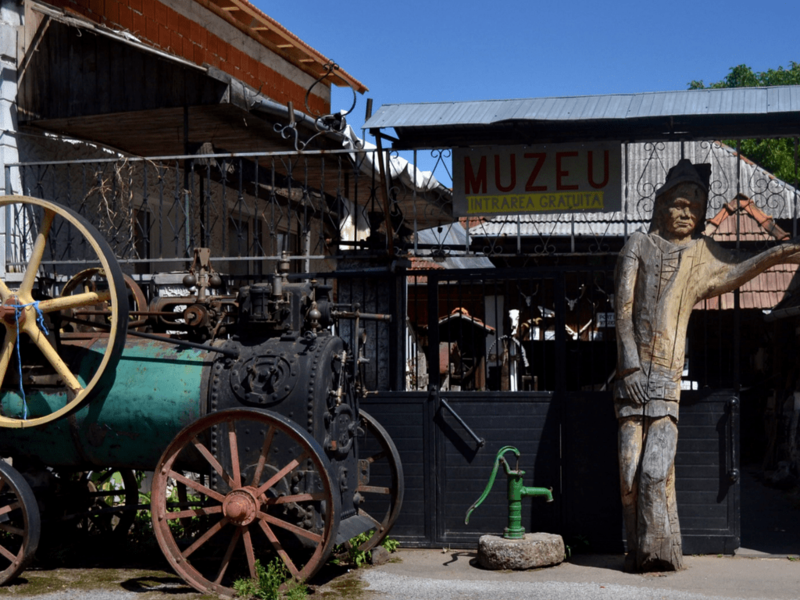 Visit ethnographic museums built by locals by the side of the road to attract tourists. 10 minutes away from Bears Cave (one of the must-see caves in Apuseni), by the side of the road, you can visit the ethnographic museum set up by a family in Chișcău. 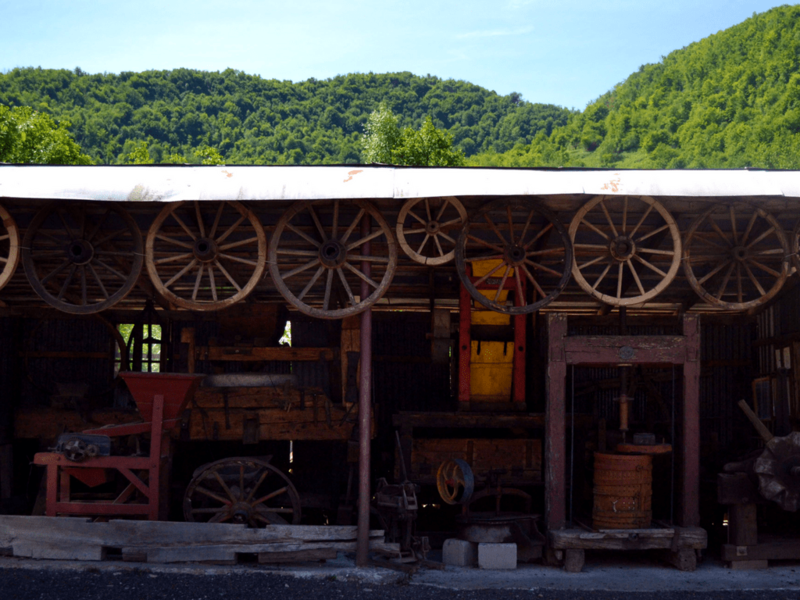 It’s a mesmerizing mix of old cars, tractors, carts. Go into their backyard to see more and even get housing there for reasonable prices. Walk around Roșia Montana AFTER visiting Geamăna lake. You might have heard of the controversy. Gold Corporation, a company controlled by the Canadians at Gabriel Resources, was set up with the sole purpose of exploiting gold in Roșia Montana, Apuseni. They promised to build the most modern mine in Romania. However, they faced popular scrutiny and resistance from Romanians who took to the streets in protest against the mining project as it planned to scrape two mountains from the surface of the earth. The story gets even more interesting. You can see the effects of that sort of exploitation 30 minutes from Roșia Montana, a mine the communist state exploited back in the 80s. The government created an artificial reservoir in a valley close to a mountain crest and evacuated an entire village. The residuals flooded the valley that was once the home of an entire community. Decades later you can only see the dome of the local church rearing its head under the copper lake at the foot of the bald mountain. Yes, I meant it, the mountain was bald: no vegetation survived the exploitation. Locals from Roșia told us that exploitation is still going on despite a lack of proper paperwork and complete ignorance of environmental legislation. You might imagine that my mind was already set: the mining project should never ever take place. And then I saw Roșia Montana. Deserted. It was like the war for the gold resources had scared all people away. Most of the population was once employed by the state mining company. People have relocated or emigrated in search of a better life. The local guide in the Roman mines dating 1900 years ago told us with regret that locals would love to work and mine the ~300,000 tons of gold that the underground hosts. Right now it’s all wasted, buried under the ground. A fan of Age of Empires II The Forgotten? Visit the Apuseni castle that inspired it. Corvin Castle, the Gothic castle, was rebuilt after a great fire based on what the architects imagined the castle should have looked like. Go visit Corvin castle, featured in the video game as the wonder of Magyar civilization. The castle is situated high up on a mountain and is said to have been the prison for the Romanian ruler Vlad Dracul, the inspiration behind Bram Stoker’s Dracula. Eat cheese pies baked on lespede (slab) traditionally prepared for weddings. And buy home-made honey you’ll pay for on your next visit. Locals advertise their Moțești home baked pies on the side of the road. Locals know how to cook and advertise it, they love to share stories on food if you grant them the time. One auntie sold us home baked cheese and dill pies just the way they cook them for wedding celebrations. Another local could not shut up about bees, honeycombs and how to nurture the patience to really understand them and appreciate their honey. When I could not buy more than one jar of honey (I did not have enough cash) he offered another: ‘You will pay next year when you get back’. Lie on a green-green hill with scattered wooden cottages and haystacks, then listen to crickets and nothing else. Not even kidding. If you take a long weekend off, wander into the green hills of Apuseni and just stay put. Look around, take photos and listen to crickets, that’s all you can hear for miles around. Refreshing, no? Maybe meditation was born in these places. Discover small towns like Ștei and how it was built by the Soviets back in the ’50s to exploit uranium from the area. Let yourself end up/sleep in weird places and … google them. I kid you not, you might find out more on the hidden history school books don’t tell. Like how Ștei town came into being and the melting pot of cultures that the city was made of, Romanians, lots of Russians and aromâni. Back in ’52 in an era of dependence on Russia, the Romanian government let the Russians come in and turn this small 200 houses village into a 20,000 inhabitant city. Why? They needed miners to exploit the wealth of uranium discovered in the area. In four years time, they built the entire town: blocks of Soviet flats, infrastructure and transportation railroads to take the uranium out of the country. Tones and tones of premium quality uranium exited the country and ended up in Russia on the account of economic deals made between the two countries. Now, with the mining industry as a whole seeing its demise, the town looks and feels dead, stuck in its history, unable to reinvent itself. Meziad Cave boasts an awe inspiring entrance. and hosts 12 species of bats out of the 27 still roaming Europe. Have fun with trivia on the 12 species of bats living in the Meziad cave. Did you know bat excrement is the BEST natural fertilizer ever? Or that bats use sound as GPS? That they are more scared of us than we are of them? Enter Meziad cave, amazing bat stories await you in the dark to tell stories long forgotten. Take in the cold air and the biology lesson. Enjoy the cold silence of the cave and photograph this amazing entrance. This was just a quick preview of Apuseni highlights, there is so much more to discover. Drop us a comment if you know of any amazing sites in Apuseni we need to add to the list.